Water Fountain or Germ-Collecting Menace? For the record, tap water and bottled water go through the same treatment process, so replacing one with the other is, well, kinda moot. But are all the fears about the safety of drinking fountains founded? Or are they just the stuff of urban legend that you hear once and never again question its gospel truth? Did you know that the first public water fountain was opened in London in 1859? At the time, that brand spankin’ new public water fountain was seen as an equalizer amid the community, as it was free to both rich and poor and aided in having a healthier public, which is certainly good for healthier republic. Though it was an auspicious start, drinking fountains would see a boom and bust over the next century, but why? The long and short of it is: people are now worried about the germs on the fountains themselves as well as the potential contaminants in the water coming through the spout. But, why? According to Gallup, 77 percent of Americans worry about the pollution in their water, making them more inclined to drink bottled water rather than fill up at a water fountain. Well, first thing’s first: can a person actually pick up germs from a water fountain? In short, the answer is: the germs are definitely there. A recent study of germs on contact surfaces in classrooms found “Influenza A virus was detected on up to 50% and norovirus on up to 22% of surfaces throughout the day,” with those surfaces including water fountain toggles, faucet handles, and paper towel dispensers. So the opportunity for infection is there, though it’s more likely to be troublesome for those with compromised immune systems, elderly folks, or children. But that’s just when dealing with the actual dispensing of the water. Unfortunately, germs aren’t the only concern when drinking some crisp cool H2O from your local hydration station. There are two more main risks in drinking from fountains. The first is the contaminants left in the fountain’s water from improper cleaning/maintenance, and the second is the contaminants that enter water from our aging infrastructure, because old lead pipes are ubiquitous in buildings built in the 1980s or earlier. Both of these causes have led to extras in the water supply at your local public park or even office building. To boot, public water fountains aren’t filtered, so there’s no stop gap between the fountain and the consumer that’s filtering out unwanted hitchhikers. Some cities and municipalities are taking action to test and address the water quality in their public aqua dispensers. In 2016, Chicago city officials closed down several public water fountains after 445 out of Chicago’s 1,891 water fountains not only tested positive for lead in the water, but also had lead levels over the EPA’s “action level,” which is 15 parts per billion. In addition, the city’s tests revealed some of the fountains even had levels that exceeded the EPA’s acceptable standard 80 times over. Furthermore, while cities are required to test municipal water supplies in homes each year, there’s no requirement for them to regularly test public fountains and sinks in public parks or buildings, like schools. Chicago’s testing of their water fountains was actually a proactive, voluntary effort. If you’re concerned about possible water contaminants in fountains you may drink from, the easiest way to avoid them is to stop drinking from fountains altogether. But as the alternative is dehydration, there’s a few other actions you can take to address what’s in the water at your local watering spout. One is to buy bottled water. Unfortunately, that’s both expensive and environmentally disastrous. A cheaper, greener option is to carry a water bottle everywhere you go and drink from your filtered water at home. 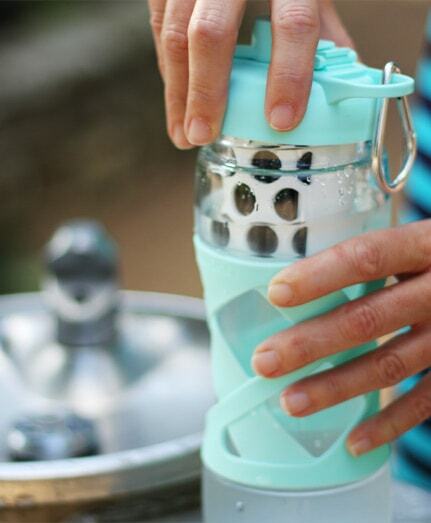 Still another is to carry a water bottle with a filter, such as Aquasana’s plastic or glass filtered bottles. Regardless, never put your lips up to the water spout, and ensure your child doesn’t — as some do — envelope the entire spout in their mouth, both spreading and picking up additional germs. In addition, wash your hands after touching the handle, or carry some hand sanitizer. Those steps all involve matters individuals can easily control, but it’s also worth leaning on your local representatives as well and expressing that it’s important to your community’s health to prioritize replacing crumbling infrastructure — including water fountains fed by old lead pipes or ones that aren’t cleaned on a regular basis because of budgetary issues. If that’s too costly a measure, ask them to push for filters on public water fountains. Aquasana’s water bottle filters reduce 99 percent (or more) of bacteria, lead, cysts and chlorine, and selective filtration will retain natural minerals like calcium, potassium, and magnesium to give you healthier water. Plus! Filter replacements cost only $15 and are good for 80 gallons of filtration. Sure beats spending that much in bottled water and saves over 600 plastic water bottles from contributing to the Pacific garbage patch. Aquasana’s filter housing and other elements are BPA free, so you don’t have to worry about the device itself contributing contaminants to your aqua. That way, everyone can have clean water in public and stay healthier to boot — no matter their economic circumstance.